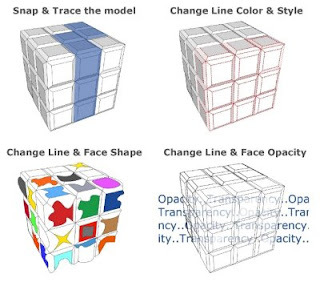 If you want more control over the style, weight and color of your model's lines or faces - LayOut can help (LayOut is included with Google SketchUp Pro 7). By applying the "Explode" feature to your model view in LayOut, you can convert it into LayOut 2D vectors. After the conversion, you will be able to snap to individual lines and faces, change their style, type, weight, color, and even their opacity. 1) After loading your model into the LayOut document, find the view you want to work with. Be sure the view is exactly what you want to see in vector form because the connection to the orginal SketchUp model will be cut off. 2) Open the SketchUp Model dialog box (Window > SketchUp Model). With your SketchUp model selected, look under the "View" tab and you will be able to change the model rendering style from the default style of "Raster" to either "Vector" or "Hybrid". Change your model to "Vector". 3) Now that your model has been rendered as a "Vector", right click on the model or go to the Edit menu and select "Explode". After selecting "Explode", your model will be converted into LayOut 2D vectors. All the vectors will be grouped together automatically. You can now ungroup the vectors and modify any of the elements you want. Stay tuned for more tips on using LayOut. can the vector files be opened in other programs (illustrator)? Vector linework can be exported from LayOut in PDF format, and Illustrator can open and edit PDF files.
" It would be great if completed layout docs couuld be exported out in vector format to dwg..."
Although this is a work around it could give you what you want, Adobe Illustrator can output a DXF file which Autocad can open. So ultimately you can get there. It is good that you can do it indirectly. with a beer or goblet of wine in hand! I notice that "exploding" your file unlinks dimensions created within layout - changing them to paperspace dimensions, instead of keeping the dimensions pertaining to the original SketchUp model.